My second face for 29 Faces. Inspired by the fabulous Denthe, I attempted a one line drawing of my daughter Samy. Wow - this is hard to do! The drawing doesn't look like her at all, but it was fun to do and I'm glad I tried. Couldn't resist adding a bit of color. Happy Labor Day -- hope you're relaxing! Here's a clip of Samy and Freddie dancing at last night's Labor Day party. Enjoy! 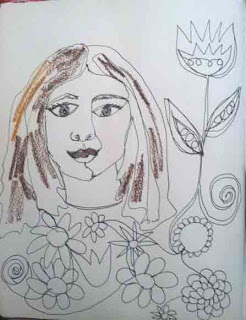 Wow, you didn't just make a face with one line but all those flowers too! I think it looks great! 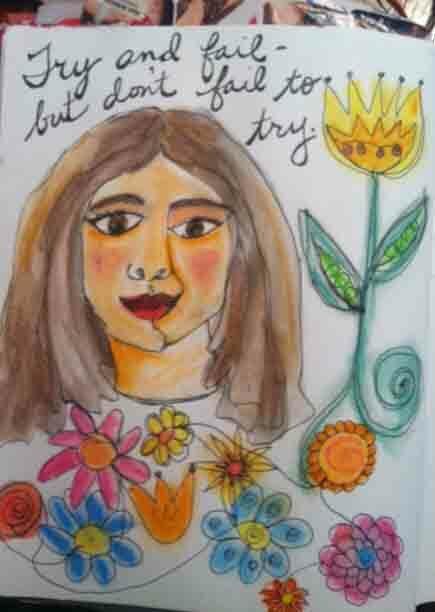 I like it a lot as well - trying new things is hard and good! I Like the face and flowers combo! I also draw pictures of my grandkids that do not especially look like them but still are okay drawings I think. I can't see the two of them dancing. Just a white square. Darn. This is really great! Does your daughter like it?